I’m excited to be a first time participant in the Christmas Tour. I must say that this year the decorations are lighter than usual, due to the fact that we just returned from a 10 day vacation. I love adding and changing decorations each year for a new and different look. I love variety, and I’m sure I’ve never decorated the same way twice. Here are just a few of my favorites this year. 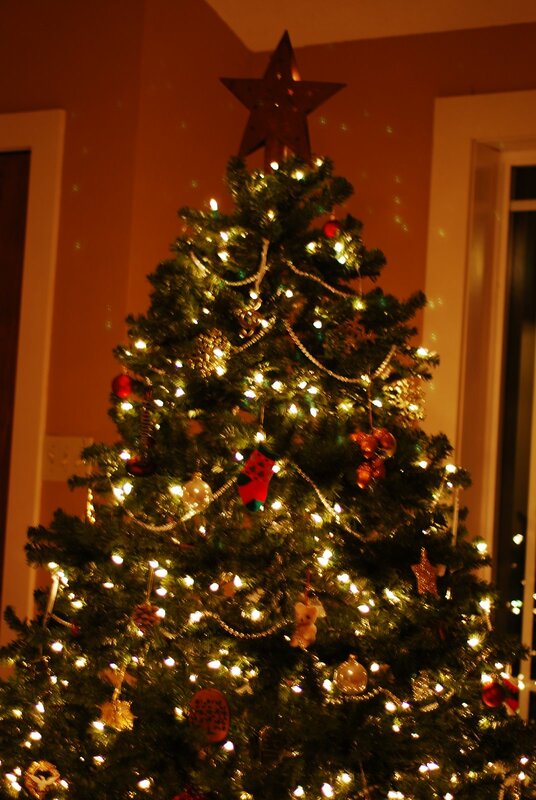 We’ve always enjoyed an “eclectic” Christmas tree, filled with ornaments that remind us of special seasons and people in our past. This year the tree focuses on reds and crystal along with all sorts of metals-silver, gold, even rusty tin with a few dashes of other natural treasures sprinkled thru-out. 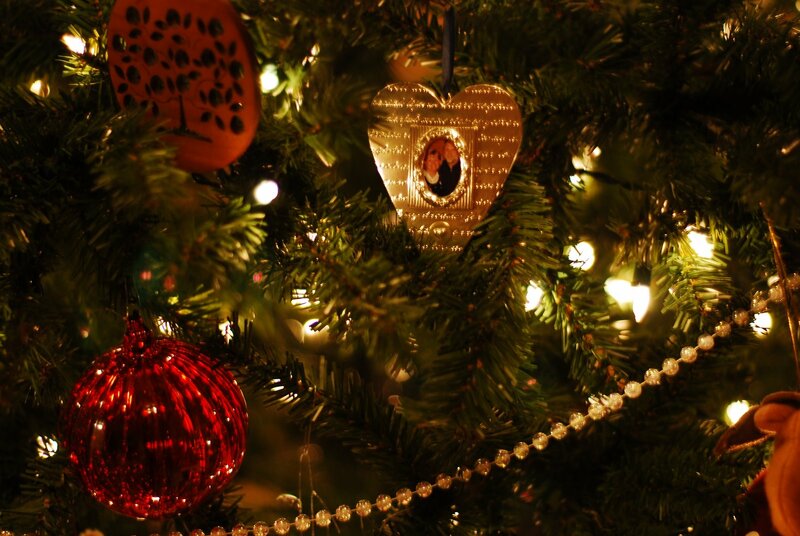 The heart shaped ornament with the photo of Terry and I is from our 25th Anniversary. This year we just celebrated our 31st in Maui! Our tree topper this year is a rusted metal star. I love the casual feel that it brings to the tree. This collection of evergreens began with the trees that lived in my Christmas village. I haven’t had the space or time to put up the whole village in the last few years, but I enjoy the trees and have even added more to the collection. The one in the center is made of metal with jingle bells hanging from the branches. It reminds me of the tree in Whoville. I found it at Big Lots for a steal. I also received the three tall white trees and another silver one (pictured behind the snacks) last year. I love the retro look of these. This bare branch hangs in my living room all year long. These previous posts tell a little about the history of the branch, including how I decorated it thru-out last year. This year it’s quite simple. 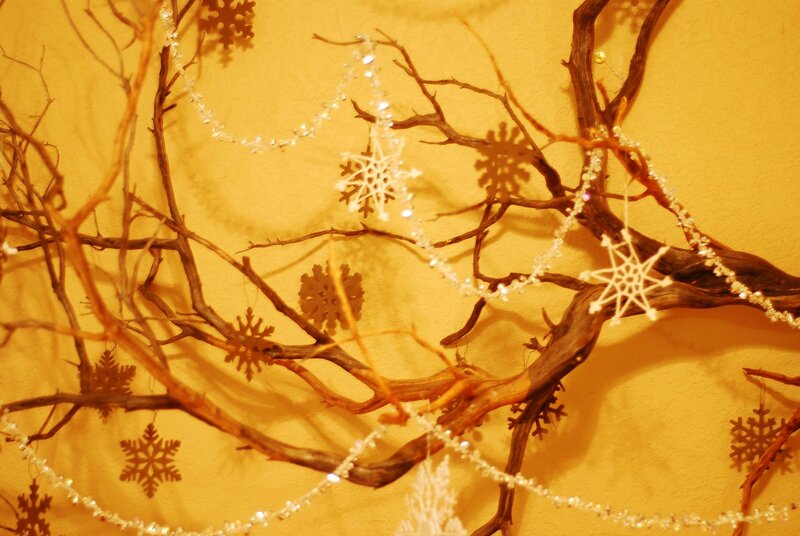 Rusted metal and white crocheted snowflakes with a crystal garland. I may be adding my Christmas cards as well. We’ve enjoyed this nativity for many years. It took me a long time to find it. I wanted one that was more realistic. 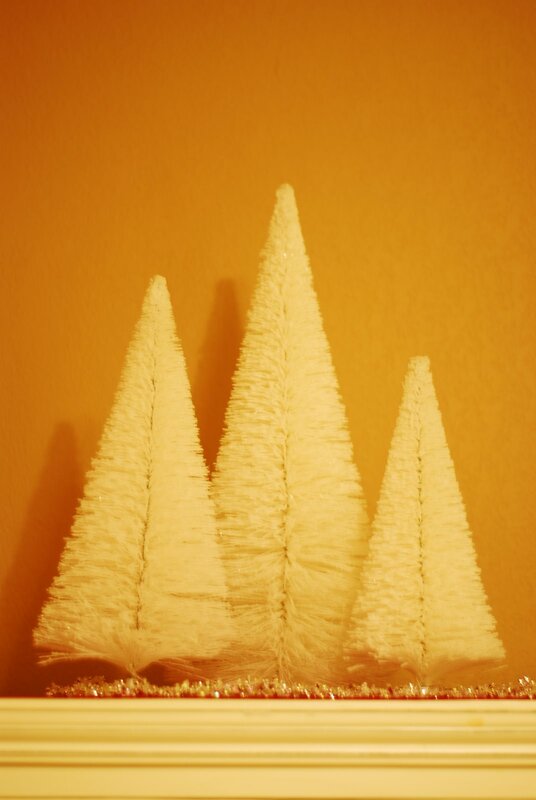 Some nativities look too “holy” while others are too cutsie. 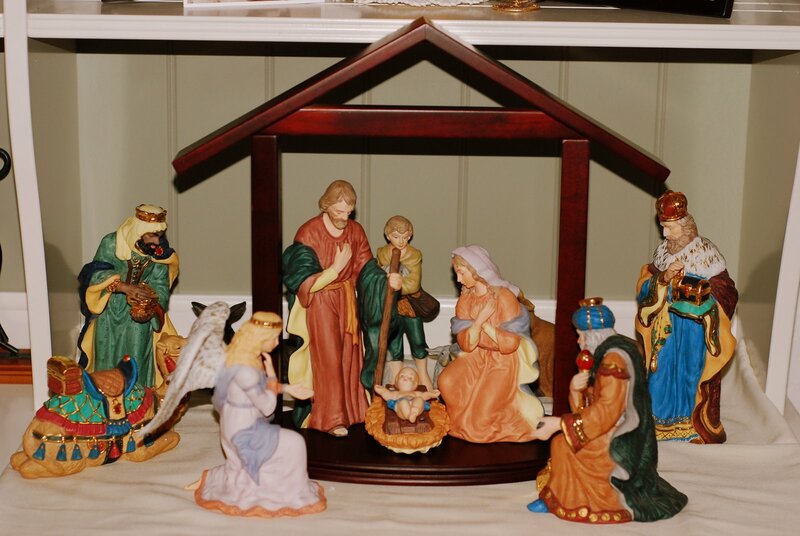 I also wanted one where the baby Jesus isn’t attached to the manger. Normally we don’t put the baby out until Christmas morning (since that’s his birthday after all). Thank you so much for stopping by my home. Since we’re just back in town, I haven’t had a chance to make a homemade treat, but for anyone who knows me, we always have something tasty to share with friends who drop by. In honor of our Maui vacation, I can offer you either a tasty cup of piping hot chocolate or a glass of wine from Maui’s own winery. We also have delicious macadamia nuts as well as extra special Hershey’s kisses with macadamia nuts inside, made only in Hawaii. 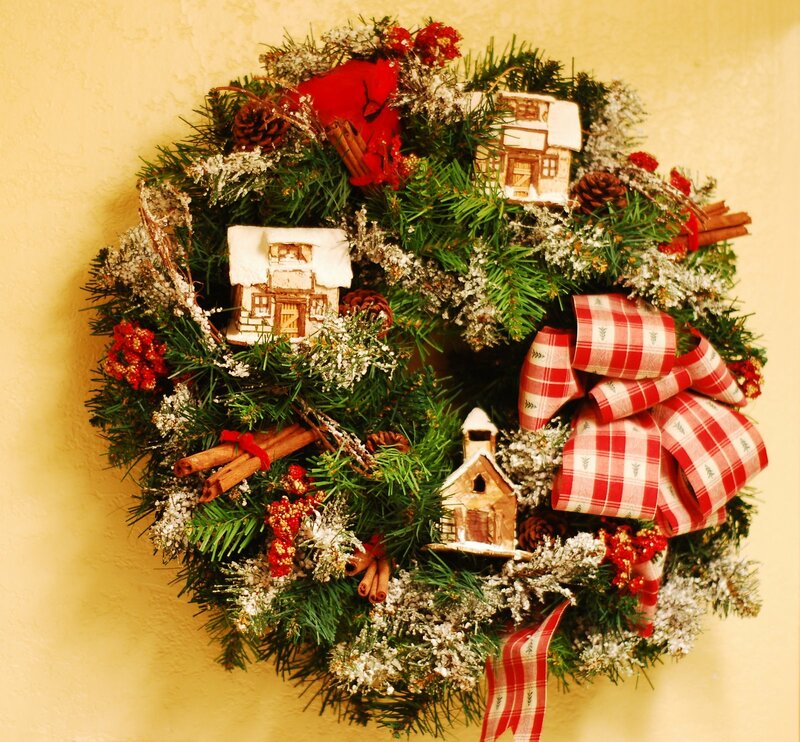 Enjoy your holiday season and may your days be filled with the love of family and friends. Very pretty! I like the variety of trees and the bare branches. Love your little trees! Thanks for sharing your tour with us.Merry Christmas! Love what you did to the branch this year!And that tree from Big Lots is adorable… gotta get me one!And love the Maui treats… the way you have it set out. What a fun reminder of your vacation!! 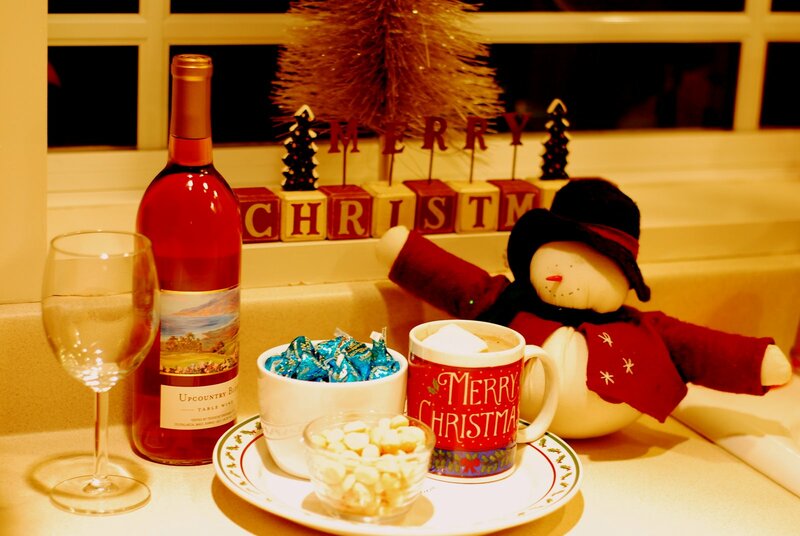 i love your wreath, and the hot cocoa looks tempting, so does the wine, thanks for sharing! I love the nativity, the treat station, the white trees…. Ok,I love it all. 🙂 Thanks for sharing your home with us.